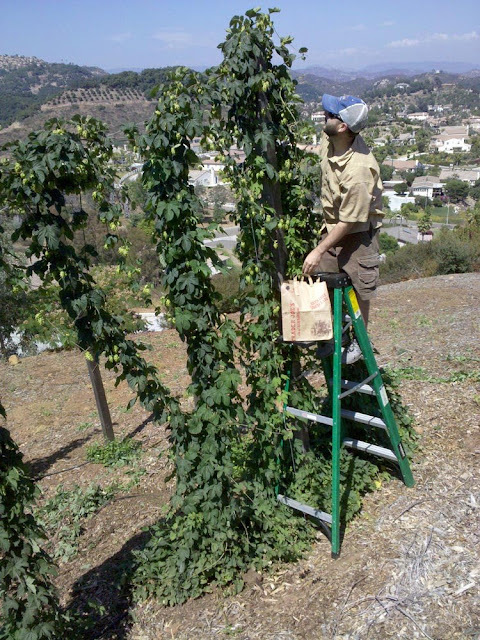 Me harvesting the Chinook Hops. This trio of vines always has a high yield with multiple harvests. 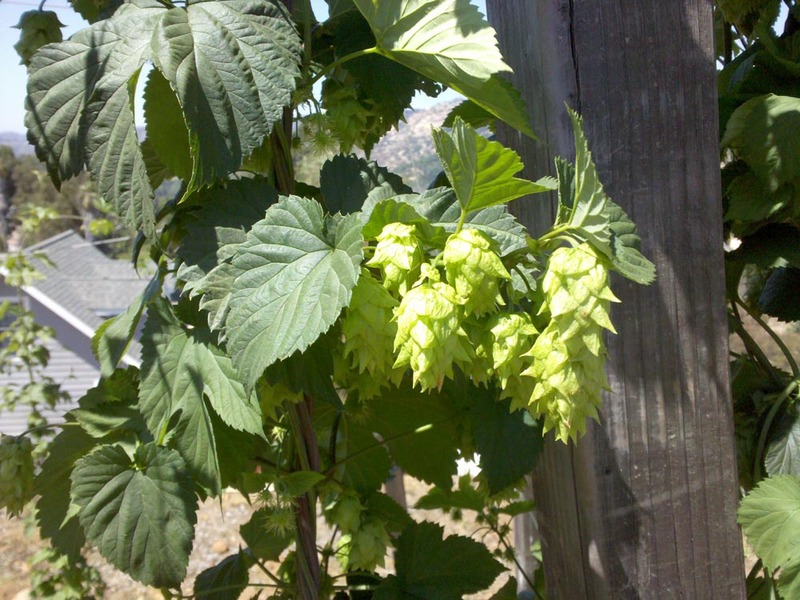 At last, fresh homegrown hops are here! Today we pulled a few weeds, trimmed back rogue hop vines, and harvested our first batch of Chinook and Centennial hops. I'll let the pictures do most of the talking. Michelle, posing at our hop farm in Escondido, CA. During the summer, there's typically little to do at the hop farm besides harvesting. There are 30 mounds yet we had a number of them that didn't do well this year. This is mainly my fault for not visiting the farm more often early in the season. This year, I need to tag or map mounds that never climbed or didn't even sprout so that I can give them attention next late winter. Our bottom row of hops has finally produced. We planted Centennial (near) and Chinook (far) last year. Third time's a charm and our added bottom row is finally taking off. I tried planting Cascade and Tettnanger when we first added this row a few years ago. They failed maybe due to soil conditions, too dry, or the killer rabbits. During the second year, we mirrored our successful top row by splitting rhizomes and planting Chinook and Centennial on the bottom row. That year, mounds were brutally attacked by killer gnawing rabbits and while a handful were able to make the climb, yield was nearly negligible. This year, we've increased the water flow rate, heavily mulched and fertilized, and ensured to allow plants to grow as full as possible at the base to deter those wascal wabbits from the main vines. 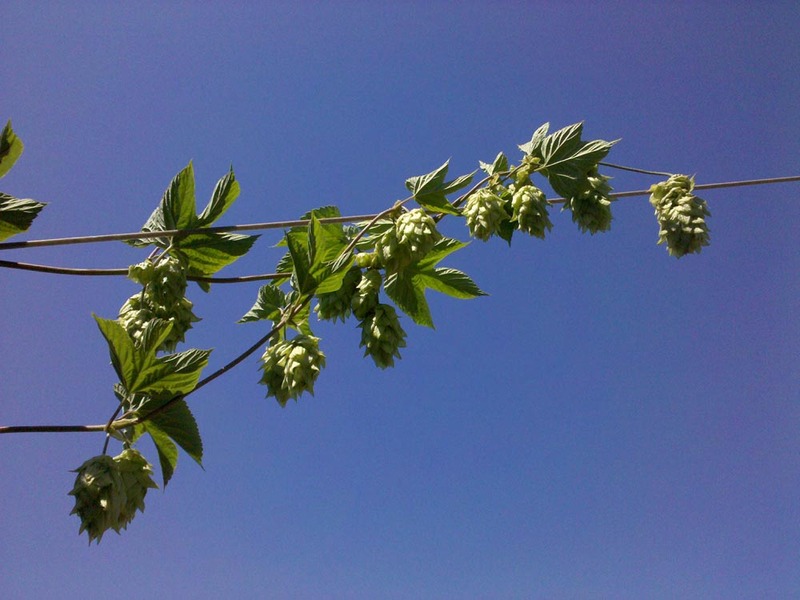 Many of the Chinook cones are papery and light, ready for picking. Many others will be ready in 2 weeks. 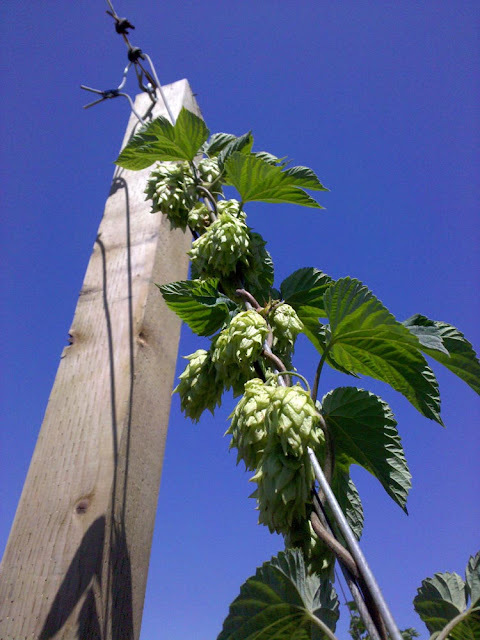 Today was just the first harvest and you can tell when the hop cones are ready to pick. They get drier or papery and become much lighter in weight. You may also see some light browning on some cones beginning to develop. This is when they are ready to pick. In the early days, we used clippers and cut each one carefully off the vine. Now, we just pull. We try to eliminate the stem by pinching at the base. After picking, my hands are sticky with a yellowish dirt color from all of the lupulin. The smell, however, is hoptastic! Chinook hops do very well here, lush full leaves with hop flowers growing at every opportunity. Healthy, happy, and full, the Chinook trio of vines on our top row never fails to just go crazy! The Chinook trio is loaded with hops. Some are ready now yet we'll be be able to pick cones for many weeks. As you can see from the above picture, the cones are in different stages. I know the big hop growers choose an optimal timing for their vines and cut them down for a single harvest. What do they do with underdeveloped hops or ones that have turned all brown. My guess is that they make pellets! Big ones! 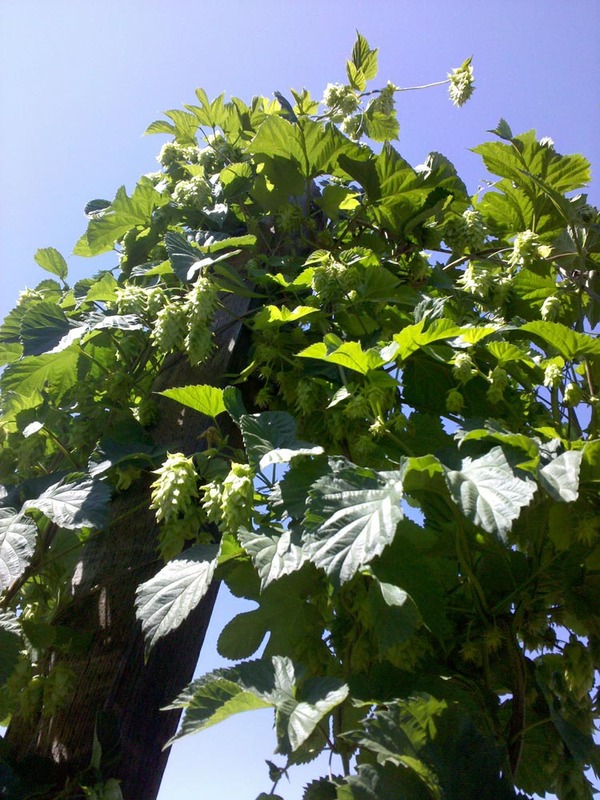 Most Chinook hops that are ready to pick are fairly large cones. Cone sizes and shapes vary with variety. 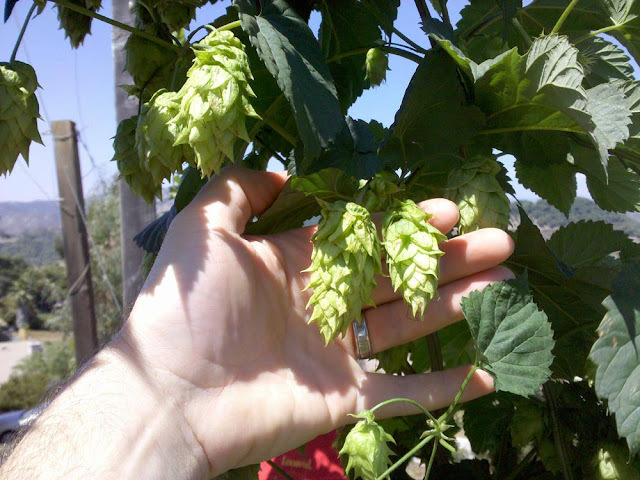 Hopefully, my hand gives you an idea about the size of the chinook hop cones. 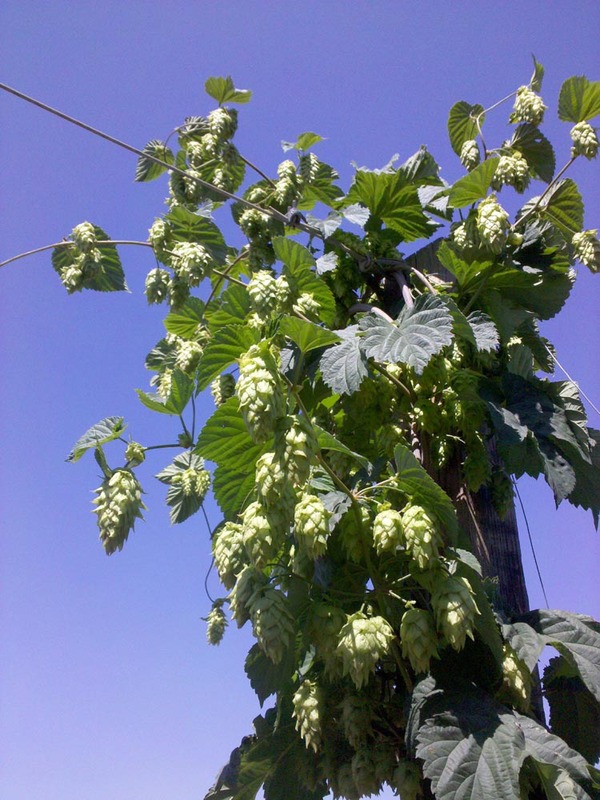 Centennial hops at the top of the wire. A terminating cone at the right. When hops reach the top of the guide line, they often continue growing horizontally. When a branch or vine ends, it always terminates with a cone. When it does this, it will grow no further. Also, if a climbing vine tip gets cut or damaged, it will no longer continue to grow. 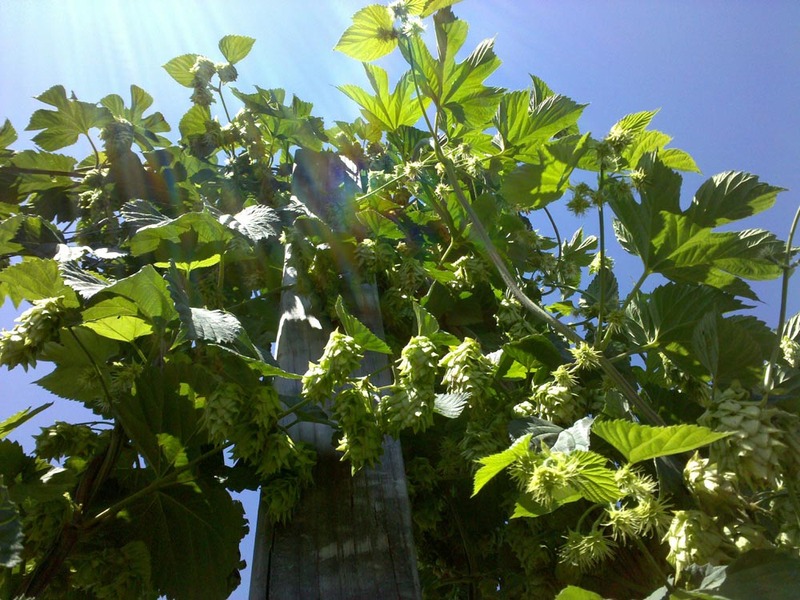 A couple of our Centennial hop mounds don't always grow as thick and lush as the Chinook trio. Many hop plants are not successful until the second season. I think the above vine was a mound that needed to be replanted. Regardless, some mounds only have one or two vines that climb and yield is fairly low. These cones are moist and heavy and will likely be ready in 2 weeks. Time to fire up the dehydrator! I need to build the box fan dehydrator I've sketched out in my mind a few years back. If anyone wants to see how I have been dehydrating and storing my homegrown hops, click here for dehydrating hops or storing hops. Cheers! Hey, quick question for you. 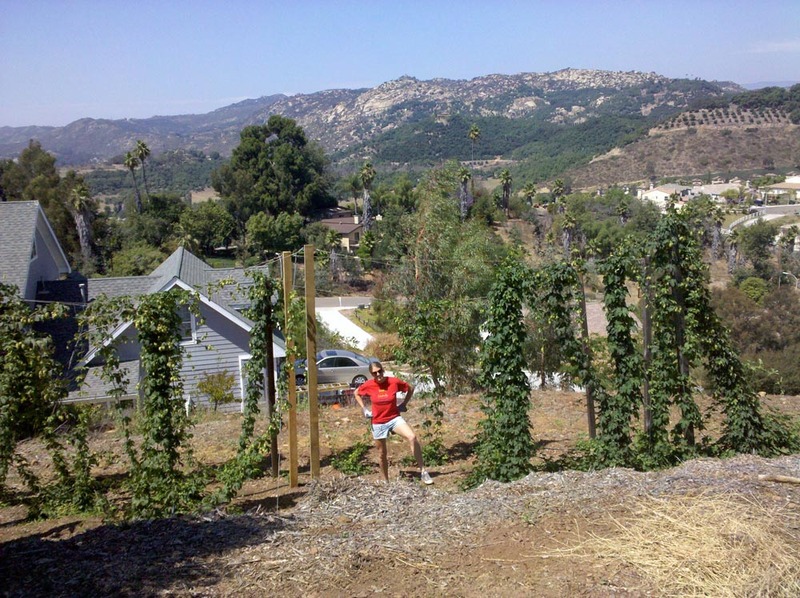 I just finished with my first season of hops in Escondido. I had great growth, but ended up losing some to spider mites. Long story, short. I harvested what i could and cut the vines down to the ground for winter. But Surprise! the vines are growing back already. I figured they would go dormant for the winter. How do you handle your vines during the winter? 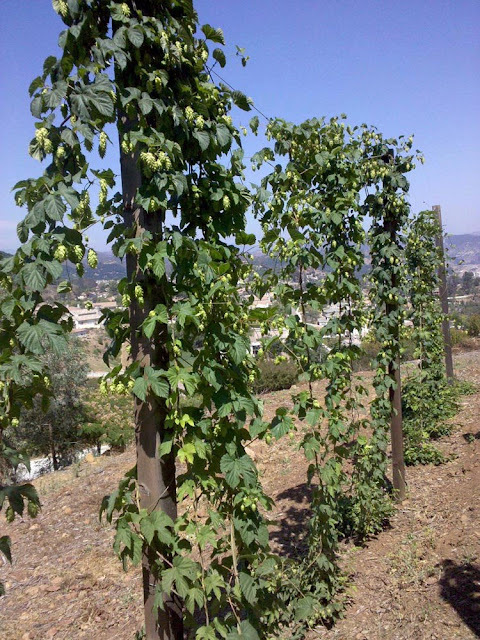 I would love ot stop by and check out your hops sometime and pick your brain on how to best grow them in Escondido. Hi Jason, It's been a while since I've been on here. The harvest this year was great. Not a particularly high yield but the best aromatic crop I've had in 9 seasons. You are welcome to send me an email when the next season gets going. Same user name, gmail. In the meantime, click on my Twitter to see more pictures from this past season.